Not surprisingly, I still get folks asking me about the choice to use (or not use) DNG files. I last wrote an article about this way back in 2011, but my own use of DNGs has changed a little over the past 5 years so I figured it was about time for an update. DNG (Digital NeGative) is a format devised by Adobe for storage of photographic RAW data. The standard is published by Adobe, and many software vendors have added support for it to their products (whether by using the libraries that Adobe provides, or their own software from the ground up – DNG is built on top of the well-known TIFF format). Rather than each camera vendor needing to have their own proprietary RAW format and make incompatible extensions to the format for each new camera model, DNG provides a common format. The standard does get modified over time to support new features but this is done in a backwards-compatible way. Some camera vendors have chosen to leverage this format and have their cameras produce it “out of the box”. Tools such as Adobe’s free DNG Converter, Camera Raw (a plug-in for Photoshop and Bridge), and Photoshop Lightroom can also produce DNG versions of any supported RAW file. Incidentally, the TIFF standard was also devised by Adobe and published in the same way. Anyone concerned that DNG is an “Adobe-controlled standard” should have a look at how comfortable they are with the TIFF format that has become an industry standard. This isn’t an issue that concerns me. First up: if we decide we want to, how can we convert to DNG? Some tools are mentioned above, and there are presumably more options by now. But I’m going to concentrate some of the ways you can make DNGs within Lightroom as that’s the scenario behind most of the questions I receive. Within Lightroom’s Library module you can use Convert Photo(s) to DNG to replace RAW files that are already known to your library with DNG versions. You can choose some different settings for the DNG, including selecting Lossy Compression and embedding a copy of the RAW file within the DNG (which obviously will make the file a lot bigger). You can also choose to leave the RAW file in place (instead of deleting after conversion), although it will no longer be visible in Lightroom. The DNG version will have replaced it (including in collections, etc). If you later delete or remove the DNG file, the RAW file will still be sitting in the folder taking up space. If you decide you always want to use DNG, you can select Copy as DNG when Lightroom is importing the files from your camera or card. This copies the RAW files from the source (and if you’ve told Lightroom to Make a Second Copy, the copy it archives is the original RAW file) but then converts them to DNG (and deletes the RAW). The specifics of the DNG file are set in Lightroom’s File Handling Preferences. You can also Export images in DNG format. Be aware that although you can export a JPEG as a DNG file, what you end up with is a JPEG embedded within a DNG wrapper. 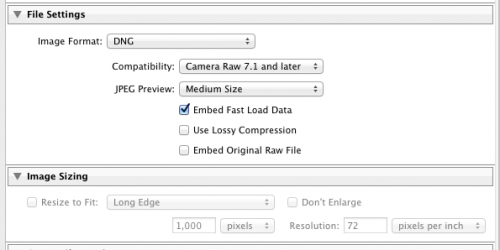 It does not magically convert it into a RAW format, and if that DNG file is imported into Lightroom or Camera Raw the processing options available will be the same as any other JPEG file. Your camera is a new model with RAW files that are not (yet) supported by your RAW-management software. This often comes up with people using old versions of Photoshop and Lightroom, but those are not the only DNG-capable RAW processors out there. If the latest version of the standalone Adobe DNG Converter supports those RAW files, you can make DNGs which your older software can handle. But importing your photos will be a manual process of copying the files from your camera cards, running them through the DNG Converter, then importing the DNG versions into Lightroom et al. You need to reduce your file storage requirements. DNGs are usually smaller than the original RAWs. The DNG format uses lossless compression: there’s no loss of information compared to the originals. 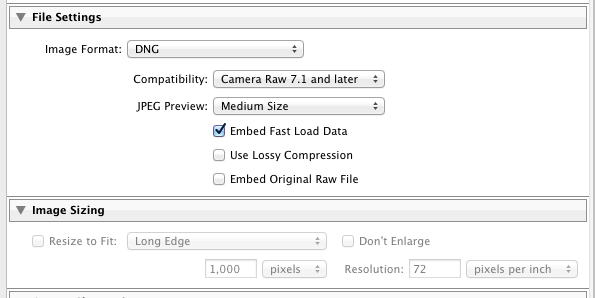 DNG also has a lossy compression option for even more space saving, although some subtle detail will be lost. The lossy option is definitely a better archiving option than using JPEGs. You want to send the RAW file to someone (e.g. a printer or some other colleague) and want to keep the file’s metadata within it rather than as a separate XMP file (this metadata can include the Adobe Lightroom / Camera Raw development recipe). The smaller size of DNG can also be an advantage here. Of course, you can send a DNG copy of the file without replacing your original. You want to be able to verify the contents of the RAW file (protecting against corruption of the file). I mentioned this in my 2011 article, and since then verification tools have improved. See for example the Validate DNG Files function that appeared in Lightroom 5. You want the preview image to represent the “processed” version of the image (as visible in Apple’s Finder or Microsoft’s Explorer). Even simple White Balance adjustments can make a big difference to how you perceive the image. However, if you use software like Lightroom, Bridge, or Capture One to manage your files then this isn’t really an important issue. You can no longer use the manufacturer-supplied RAW processing software (such as Nikon Capture and Canon’s Digital Photo Professional) to process those files. This might not worry you, but it’s good to have options. You cannot use the images for many photo competitions. It’s important to note that some reserve the right to disqualify images if you can’t supply the original camera files. Examples include the Wildlife Photographer of the Year, ANZANG, and some categories of the AIPP Professional Photography Awards. These are usually awards related to documentary (including nature) photography where they need some assurance that the photos have not been unduly manipulated. At the moment it’s common for these to specify that DNG is only acceptable if it’s the native format of the camera. More and more competitions are adopting similar review processes. However recent changes to the requirements for exhibitions/salons with FIAP patronage include measures that can apply to all categories, and require authors to be able to present the original file as recorded by the camera. Your backups can take longer. If you tell Lightroom to Save Metadata, it will save the metadata (including the current develop recipe) into the DNG file instead of just updating an XMP “sidecar” file beside the RAW. If you backup your files via file synchronisation (copying new/modified files), this is a disadvantage because the next backup will have to copy the whole DNG file instead of just the small XMP file. This can be significant if you add a keyword to hundreds of files at once (not unusual). And it’s even worse if the DNG file contains a copy of the original RAW file! Converting to DNG takes a lot of time (and battery power). This is especially relevant for using a laptop in the field. If you use Copy as DNG Lightroom will copy all the files, and then will initiate the DNG conversion step (at the same time as rendering previews). That will then slow everything down, and if you’re downloading lots of images (as I sometimes am) that can be a major issue. DNG gives you no significant performance improvement. This may be a bit of a controversial statement, but I have found that if I’ve set up my machine efficiently (with as much RAM as possible, with the catalog and previews stored on SSD, and with a reasonable size of Camera Raw cache) I have found no noticeable speed advantage of working on DNG files rather than CR2 files. And as an Adobe Certified Expert in Lightroom, I’m reasonably confident about this! 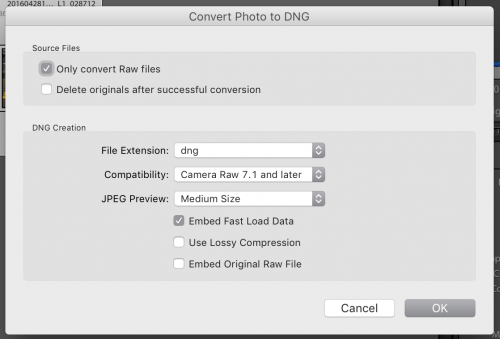 I do not convert all images to DNG format as they’re imported. I do have DNG files in my library. Some of them were created through Photomerge and HDR merges, while some came from cameras that generate DNG files directly. Some were created in the past (I converted many years-old CRW and CR2 files to DNG to save space, but I’m not likely to do that in a hurry again: disk is cheaper). Occasionally I export DNG versions of images to send to colleagues I’m collaborating with, and I often use DNG format simply for the compact file size. I can always convert images to DNG in the future if I need to, but unless I keep the original files around then it’s a one-way conversion. So why convert now? I can save a bit of space (and across thousands of photos this can add up) but then again storage drives keep getting cheaper. The user interface on these isn’t very friendly at the moment, but I do use other tools (including Lloyd Chambers’ IntegrityChecker) to validate that my files have not been corrupted. Doing the validation outside the DNG format is assisted by the fact that most of my files aren’t DNG (and thus their metadata is written to separate XMP files instead of causing the DNG to be flagged as a changed file). So that’s where I’m up to. Hopefully this information will help you decide when you want to use the DNG format. New photo workshop: Russian Far East!